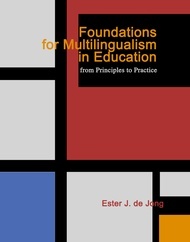 In Foundations for Multilingualism in Education: From Principles to Practice, Ester De Jong brings together her thorough knowledge of the field of bilingual and multilingual education and her passion for equity for all students learning in two or more languages. De Jong provides her readers with a detailed overview of theory, research, and policy and then suggests four key principles for working effectively with multilingual learners in schools. This foundational book is a must for all educators in our multilingual global society. A compelling, comprehensive, and intellectually rich case for bi/multilingualism in education that students, educators, parents, policymakers and more experienced researchers will find invaluable. De Jong provides a multi-layered social, economic, political, legal, and educational rationale for multilingualism along with visions for successful practice and policy. Much has been written about educating English language learners, but Ester de Jong provides a unique perspective that is extensively supported by research and richly illustrated with useful examples. This is an excellent distillation of the most recent research and thinking on bilingualism in education. This book is the most contemporary and solid treatment of the foundations of multilingualism and their application to educational settings. The book contains rich examples of what schools can do to promote multilingualism holistically, so that expressing meaning, emotion, and thoughts in two or more languages not only benefits multicultural societies, but also affirms individual learners' identities within such societies. De Jong's book should be required reading in all teacher education programs, so that new teachers learn deeply about the multilingual worlds of the students they are likely to teach. Is a welcome comprehensive resource for researchers that encompasses what is traditionally known regarding bilingualism and multilingualism, and the most current concepts found in the available research. It systematically and clearly identifies areas in need of further research. Offers a comprehensive and in-depth resource for educators and students seeking to acquire a solid theoretical base on issues related to bilingual and multilingual development to be in a better position to advocate on behalf of their bilingual/multilingual learners in schools. Provides questions to encourage reflective and critical thinking on the part of readers, stimulating ideas for further inquiry and research on the various topics. Assists readers in building or solidifying the linguistic repertoire needed to access research in the areas of bilingualism and multilingualism through the presentation of key terms, guiding questions, ideas for discussion, stimulating activities, and recommended readings found at the beginning and end of the chapters.